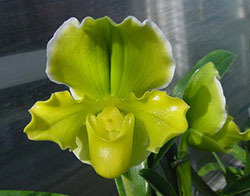 Our orchid special for this newsletter is a bulldog paphiopedilum. This type of paph is only available in bloom this time of year. They have large waxy flowers that last for months atop bold dark green foliage. It's the length of our days and the cool evening temperatures that encourage blooming this time of year. Our Paph. Dreaming Emerald 'Green Ripples' x Hellyer 'Graciously Green) are growing in our 4.5" x 3.5" hydro kits and are in bud now and ready for shipping. Regular price for these paphs is $58.00. 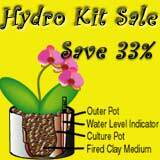 We have them on sale while our supply lasts for $44.00 plus postage.